The Hariharnath Temple is devoted to Lord Shiva and Lord Vishnu. According to legend, Lord Rama built this temple while visiting Janakpur. The temple draws a large number of people on the full moon day of the month of Kartik. The Sashisena Temple was constructed to commemorate the love of sashisena, the princess of Amaravati with Ahimanikya, the son of the minister of that kingdom. The love story is well popular among the people in every villages and towns of Subarnapur. Also famous as the temple of Gyanadei Maluani, having no opening at all this monument speaks the tantric practices that once flourished in that land. Popularly called Nimuhin Deul by the locals Sashisena temple was constructed by king Biramitra Singh Deo, the illustrious ruler of the Chauhan dynasty of Subarnapur. One can reach Subarnapur either by bus or train. From Subarnapur one can visit Sashisena Temple by bus or taxi. 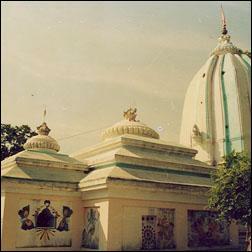 The temple of Sureswari is the oldest Shakti shrine of Subarnapur. Legend associates Lord Parsuram with the installation of Goddess Sureswari after the assassination of the Kshatriyas by him. Her icon is found facing towards north in the temple. This monument is known be built by king Achal Singh of Chauhan dynasty. This temple is situated on the confluence of river Mahanadi and Tel. The lingam of the temple is very old. Legend associates Lord Ram with its installation. Lord Kartik and Ganesh along with Goddess Parvati are worshipped here. 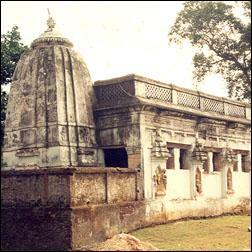 A Durga temple is also found near the Rameswar temple where the image of a ten-armed Durga is enshrined. Here Durga is also worshipped as Shakti like Parvati. Outside the boundary of the Rameswar temple there is a Brisabha temple and a colossal image of Brisabha, black in colour is installed there. According to B.C. Majumdar the Rameswar temple was built by the Chauhans. But according to B.C.Rath the Somavamsis had built this monument. 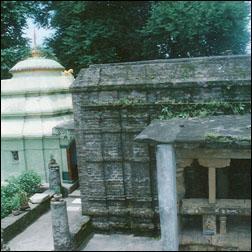 The Kosaleswar temple at Baidyanath on the bank of river Tel, situated about 14km. to the south-east of Subarnapur is now in a very bad state of preservation. The structure even in its ruins is a remarkable monument. The temple provides striking features of an earlier Buddhist shrines refurnished by the Hindus. Large sized bricks, polished and well set mortar, inter columnation and isolated niches to hold individual images, all .Buddhist structural features are met in Kosaleswar temple which has led scholars like Charls Fabri to suppose that this temple was built on the ruins of a Buddhist monument. But, the structural details of the temple suggest that it belongs to a much later period. Here iron bars were used and the earliest use of such iron bars in the Odishan temple is noticed in the Simhanath temple of Gopinathpur in Cuttack district, which has assigned to a date not earlier than the 9th. century A.D. On the lintel of the doorway of Kosaleswar temple all the nine planets are depicted which seems to be a later development. However, the opinion of Charls Fabri that Kosaleswar temple was originally a Buddhist structure refurnished by the Hindus appears to be a conjecture. The architecture and sculptures of this temple are the best specimens of plastic art, which can be dated to about 7th century A.D. or even earlier. Again, the two handed image of Kartikeya provides comparatively an early date to the temple. The figures of Gods and celestials are provided with haloes around their hands, which is also an early feature. But basing on the structural detail N.K.Sahu is of the opinion that the Kosaleswar temple was constructed during the reign of the Telugu -Chodas in the last part of 11th century A.D. or 12th century A.D. There is a clear reference in one copper plate record that Baidyanath (now known as Kosaleswar) was the tutelary deity of the Telugu-Choda ruling family. So the architectural and the iconographic features of the temple of Kosaleswar very often are self contradictory and do not help in arriving at a conclusion to find out the initial period of the construction of the temple. The icon of Goddess Khambeswari in the form of Vanadurga is found in the temple. The earliest reference of the Goddess is found in the Terasinga Copper Plate of Maharaja Trustikara of 5th century A.D. Subarnapur was a very important stronghold of the cult of Khambeswari during the reign of the Bhanjas and the Somavamsis of 9th - 10th century A.D. 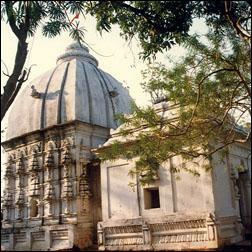 The temple of Khameswari at Subarnapur represents the most vibrant manifestation of this cult. It is said that the Khemidi princess during her marriage with Rajaraj Singh, the Chauhan ruler of Subarnapur had brought this icon of Khambeswari to the royal palace. Later on the Khambeswari temple was built by the king. 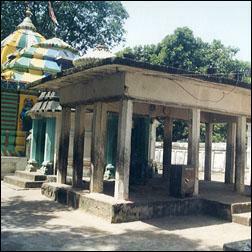 The Paschim Somanath temple lies in the, western corner of Subarnapur town. Lord Somanath was worshipped in a funeral ground, situated in the western corner of the town. He was the presiding deity of the powerful Somavamsis of South Koshala and Odisha. The Paschim Somanath temple was constructed by king Prataprudra Deva. 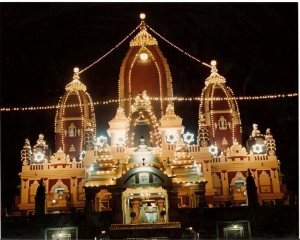 It has Mukhasala, Vimana, Brisabha mandap, Chandan mandap. Homa mandap etc. Inside the compound of the temple a south-faced Hanuman and a Bhairava facing to the west are found. Brisabha is worshipped here by the Saivites before the worship of Siva. In this temple Goddess Parvati in the north, Lord Ganesh in the south and Lord Kartik in the west are worshipped as Parsvadevatas. Jatesingha, located at a distance of 7 km. 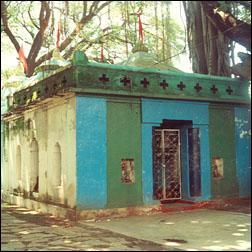 from Birmaharajpur is the birth place of Bhima Bhoi, the celebrated poet of 19 century and propagator of Mahima cult. It is important to mention here that when the educated and urban people of Odisha were inclined towards Arya Samaj and Brahmo Samaj, a new faith came into prominence in rural area which is no other than Mahima cult. Jatesingha can be visited while going to Godhaneswar temple and to the Vaisnavite monastery at Khamar. One can reach Subarnapur either by bus or train. From Subarnapur one can visit Bhima Bhoi Birth Place by bus or taxi. 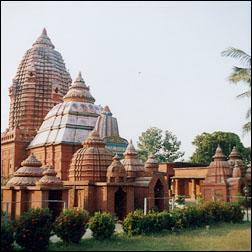 The Gokarneswar temple is located on the bank of river Mahanadi in the western corner of Subarnapur. Lord Gokarneswar was the presiding deity of the Imperial Gangas. 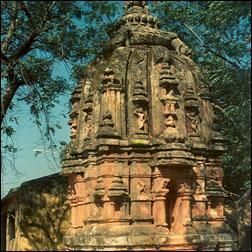 His temple was constructed by the Chauhan rulers of Subarnapur. Goddess Ramchandi is also worshipped with Lord Gokarneswar here. The most important place to be seen at Birmaharajpur is the Champeswar Shiva temple. This monument is situated at the village Champamal, 2 km from Birmaharajpur. Legend says, a devotee of Lord Rameswar Shiva of Subarnapur named Champa Hota, who happened to be the Birtia (headman) of the village Chamapamal with his wife used to come regularly by foot from his village crossing the river Mahanadi and walking for about 17 km to worship Rameswar Siva whose abode is located on the confluence of the river Mahanadi and Tel. They did not take food till the meditation was over. Once they could not come to Lord Rameswar due to heavy flood in the river Mahanadi in the rainy season. Lord Rameswar told Hota in a dream that he would personally appear in his village in that night. On the next day Champa Hota saw the emergence of a Shiva lingam inside the Shakti near the gilla bushes where a black cow was milking her sportive calf. He built the temple for the Lord and dedicated the village to his honour. The Champeswar temple was built during the reign of the Chauhans in 17 century A.D. Two pieces of roughly hewn sandstone representing Champa Hota and his wife are placed in the northern and southern sides of the temple respectively and the devotees of Champeswar Shiva pay due homage to them till today. 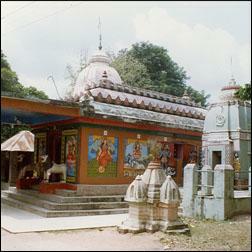 Apart from the main temple this shrine has the jagamohan, notamandapa and bhogamandapa. Hundreds of people gather here daily for a darsan of the Lord. Shivaratri here is the main festival. The mother Goddess in form of Bhagabati is worshipped here. 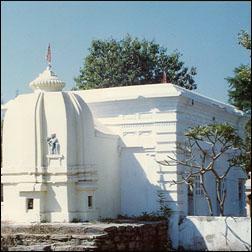 This temple is situated at a little distance from Rameswar temple. She is the presiding deity of the people of Subarnapur and is believed to be their protector from all evils. An icon of the Goddess facing towards west is found in the temple. The Bhagabati temple is said to be built up by the Chauhans. One can reach Subarnapur either by bus or train. From Subarnapur one can visit Bhagabati Temple by bus or taxi.